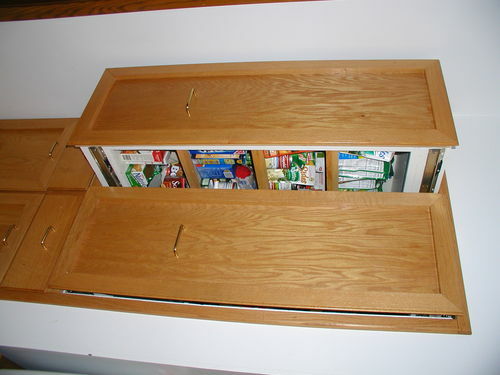 Hey guys client wants pantry pullout units. Has anyone got any options other than $450/slide set? that is one item that is on my bucket list to make. it can be easily moved to another spot. or, if I move to another house, I can take it with me. my idea is to make a wood box about 14” wide, 6’ tall and 30” deep with a door. 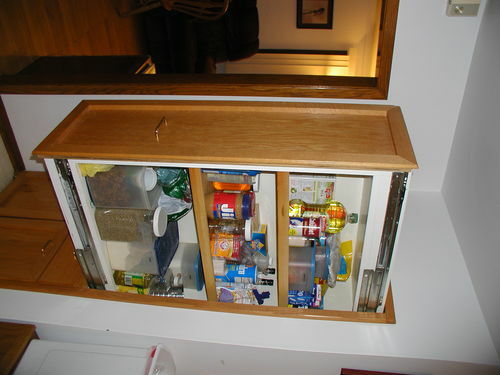 it will basically be a tall narrow cabinet with fixed shelves for canned goods and “stuff”. top and bottom of each slide-out will have 24-26” heavy duty 200# full extension drawer slides. depending on the space available, will dictate how many slide-out units you can have. 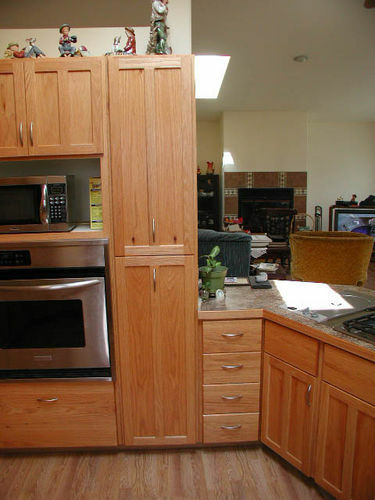 I would not go with wheels or castors on the bottom as that looks like a recipe for disaster right from the git-go. 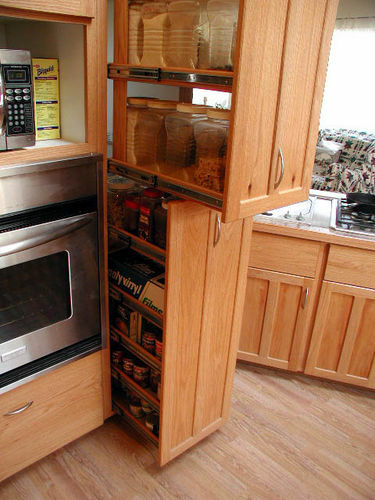 in the traditional horizontal drawer style. 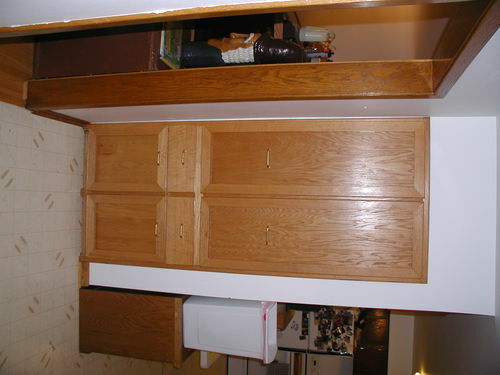 something like this in a big tall cabinet as one solid unit. firmly anchored to the wall. John Smith. That is awesome! 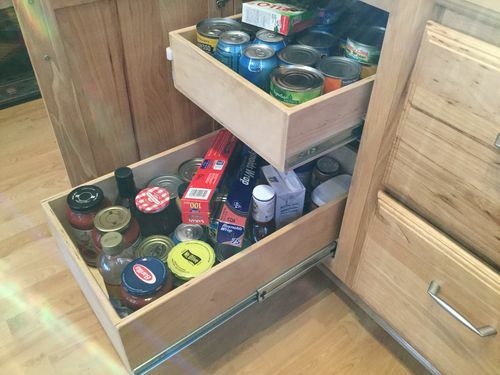 I made a pantry using the nasty ole melamine that everyone hates. I built the in 2004 and it works as good now and it did the day is was installed. That’s 14 years ago now and I didn’t have to paint or finish anything but the face frame and doors. Anyway you failed to provide any information as to the the size or much else so I don’t know if something like this will work for. But hey it at least give me a photo. In a nutshell all it is, is a box full of drawers tied together in a manner that splits it into 2 pull out sections. Tie them all regather and have one pullout. Your choice. The question is about the slide sets, not whether I can build them or not. Sorry if I confused. AKGuy it is a full height pull out like you pictured. 24W X ~84H. I didn’t think about a slide for every tier that is definitely something to consider. But my thing on this is it has to be very good hardware to hold up. 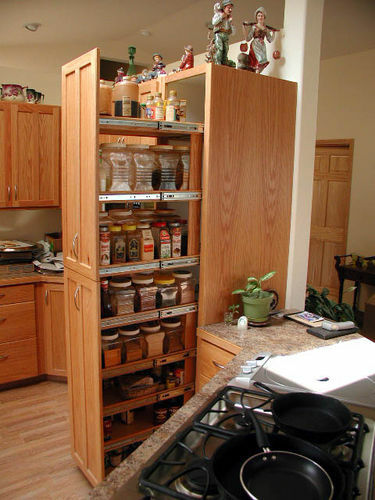 If anyone has used these pantry slide systems how did they do? I just use the economy #100 side mounted slides. I get a box of 10 for 40.00, I use Baltic birch for the boxes. Alaska I like that.. Do you think a guy could eliminate some of those slides, or is it to heavy?